Beginning today the Catholic Church enters Holy Week the most sacred time of its Liturgical year. As we celebrate Jesus’ triumphal entrance into Jerusalem today, we prepare to gather in Church several times this week to commemorate his salvific passion, crucifixion, death and resurrection. Lent the forty days of spiritual preparation for Easter comes to an end at sundown on Thursday. That begins the three sacred days called the Sacred Triduum. We count these three days as the Hebrews would have counted them. The Sacred Triduum begins at sundown Thursday and ends at sundown on Easter Sunday. Those who really are attentive on Holy Thursday will recognize that there is no final blessing at the end of the Mass of the Lord’s Supper. That is because the liturgy of the Sacred Triduum continues the next day, Good Friday, with the Commemoration of the Lord’s Passion and Death at 3PM. 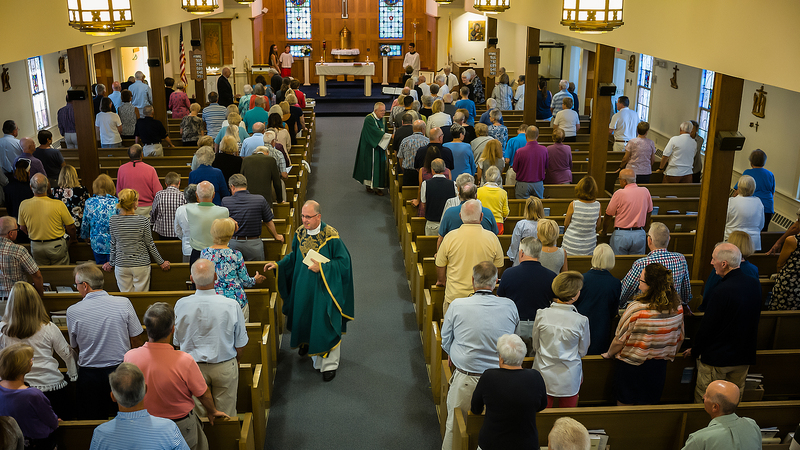 This service is not another Mass but a continuation of the liturgy begun the evening before. The priest and deacon enter in silence and begin the service without the normal greeting at the beginning of most liturgies. At the end of the service they leave in silence again showing that the liturgy will continue with the Easter Vigil at 7:30 PM on Holy Saturday evening. The Triduum reaches its climax with the Easter Vigil. It begins with the blessing of the new fire used to light the Paschal Candle that represented the presence of Christ the Light of the World. During the vigil the liturgy includes a series of reading that are meant to help the faithful recall God’s saving work throughout salvation history as we await the resurrection of Jesus on Easter morning. If there are any adults entering the Church through baptism or conversion the sacraments are celebrated with them at the vigil. The Easter Vigil is the most beautiful liturgy of the year but it isn’t a short Mass by any means so if you come be prepared for its length. At Easter one of the most important parts of the celebration is our renewal of the Baptismal Promises we made or had made for us at out baptism. This week as part of your prayer take time to reflect on these promises. Open your heart and soul to God’s grace so you can respond “I do” to each of the questions with fervent faith. Please plan to clear your calendar so that you can participate in as many of the liturgies of Holy Week as possible. Tenebrae is Latin for "shadows" or "darkness." It can also be translated as "night" or "death." The Tenebrae service is an ancient tradition in Christian history. The purpose of this service is to remember the somber events that occurred in Jesus' life from the exuberant entrance into Jerusalem on Palm Sunday through the night of Jesus' burial on Good Friday. The most distinctive aspect of the service is the use of a Tenebrae "hearse," a holder for several lit candles. The flames of these candles are extinguished one by one as Scripture readings are shared to tell the story of Holy Week. This gradual descent into gloom is a representation of Jesus' increasing sorrow as the events of Passion Week unfolded. After the last verse is read, the last candle is put out, and the room is plunged into darkness. Lenten Folders- Beginning this weekend we have a collection box at the front of the Church to collect your completed Lenten folder. Parishioners received a Lenten Folder before Lent began. We asked you to put aside a quarter a day for a total of $10 over the entire Lenten season. Your donation will be combined with those of other parishioners’ and sent to Food for the Poor to build a modest home for a family in Haiti. The cost of a home is $3,600. Last year parishioners donated $4,000. A poster with a picture of the Montrevil Family of Plaine Du Nord, Haiti in front of the house we built for them is at the front of the church by the baptistry. Come take a look. How about building two homes this year?